What happens if the Moon were destroyed? According to astronomers, the Moon was in danger by the asteroid collision that could make it crumble. But what if turn out the human themselves who want to destroy the Moon? For whatever reason, it might be going to be a reality in the future. To destroy the Moon, we need at least as much as 30 trillion megatons of TNT. It's terrible amount of explosives isn't it? But even with the amount of TNT as it is, the Moon still not be destroyed in a super small pieces. Still in a large chunk of the rest of the explosion remains to be gathered in the Moon 'region' because its gravity. So what happens if we or even the collision of asteroids are actually able to destroyed the Moon? 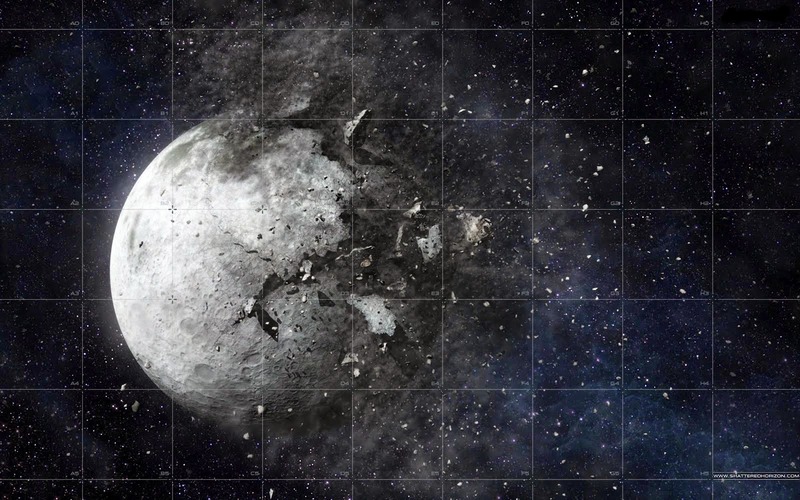 Yes, if the Moon were destroyed until the pieces are small enough. Then the fragments will be attracted by the Earth's gravity and rotation of Earth that will make the Moon flakes forming rings like Saturn's rings. Every day, meteors and asteroids wandering around the Earth and the Moon. And since immemorial time the Moon has protected us from the celestial bodies, like asteroids or meteors. Large and small asteroids that could have lead to the Earth will be retained after they hit the Moon first, Therefore, as we know that in the Moon is so many craters which made by the collision of celestial bodies. Since a long time ago, Moon's gravity assist Our Earth formed their own lives. One is the Ocean and the Pole. Thanks to the Moon, the North and South Pole slowly formed and help balance the Earth's temperature. And thanks to the Moon also, the ocean is wavy. These waves are vital to life on the seabed. The waves that form currents in the ocean will bring a source of food and seeds of living things in seabed. If all of this is interrupted, then the apocalypse just a matter of time for the living creatures on the land. The Moon itself act as a counterweight movement of the Earth's orbit and rotation. Earth's orbit around the Sun will be disturbed and become unstable, the effect was our planet can be bounced away from the Sun, or fall into the sun. And then Earth's rotation becomes unstable, be prepared to experience the day-night chaotic cycle which has also resulted in extreme temperatures changes.